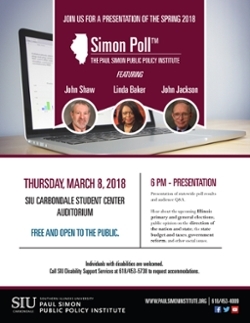 CARBONDALE, Ill. — With the Illinois primary election less than three weeks away, an open discussion March 8 will examine the 2018 statewide political campaigns and recent social issues polls by Southern Illinois University Carbondale’s Paul Simon Public Policy Institute. The Simon Poll™ presentation is at 6 p.m. in the Student Center Auditorium. Admission is free and the public is invited. There will also be an audience Q-and-A session. government reform and social issues — including legalizing marijuana. “The Simon Institute has measured and analyzed public opinion in Illinois for a decade. The Institute’s polls have offered provocative and rigorous snapshots of the mood of the state since 2008,” Shaw said. The polls have also “served as an important resource for scholars who are seeking to understand important longer-term trends that shape our public policy debates,” Shaw said. The staff will outline the main findings in this year’s polls and looks forward to discussing with the public and university community the “hopes and concerns of the people of Illinois that are evident from this most recent Simon Institute poll,” Shaw said. More event information is online at paulsimoninstitute.siu.edu/ or by calling 618/453-4009. Conducted since 2008, the Simon Poll™ is an annual statewide poll that asks Illinois voters opinions about current public policy topics — typically with a focus on state budget issues — as well as political and electoral reform, politics and social issues. The Paul Simon Public Policy Institute celebrated its 20th anniversary in 2017. Discussion: March 8, 6 p.m.